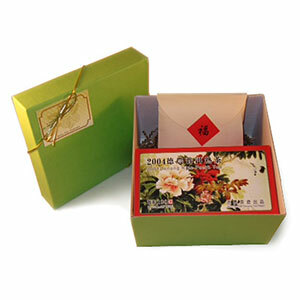 This gift pack consists of a box of 100g Denong Red Label Ripe Pu-erh (2004 Vintage) and a pack of 20 Tea Pockets in which you can put the loose Red Label tea leaves in and make your own tea bag. The red decal on the envelope that holds the Tea Pockets depicts the Chinese character “Fu,” which means “good fortune” or “blessing.” The gift of this 10-year-old ripe Pu-erh is perfect for a Pu-erh novice or a Pu-erh connoisseur. For detailed information about Denong Red Label Ripe Pu-erh tea, please click here. A year ago I was clueless about tea. Buying your tea cakes has been wonderful!